The Venerables Appreciation award is made to those few members, who have truly distinguished themselves by their sustained leadership and the exceptional service they have provided in building and strengthening the Venerables. Nominations for the Award are submitted by current members to the Past President for consideration by the Board on an annual basis. Past President Jim Thomas presents Andrew Lamb with the 2018 Venerables Appreciation Award for many years of dedicated service including two terms on the Board, ultimately as President in 2015/16. President Andrew Lamb and past President Gary Pennington present Tom Stephens with 2016 Venerable Appreciation Award for his dedication and sustained contribution to the club. President Gary Pennington and past President Ed Welch present Peter Tibando with 2015 Venerable Appreciation Award for his dedication and sustained contribution to the club. 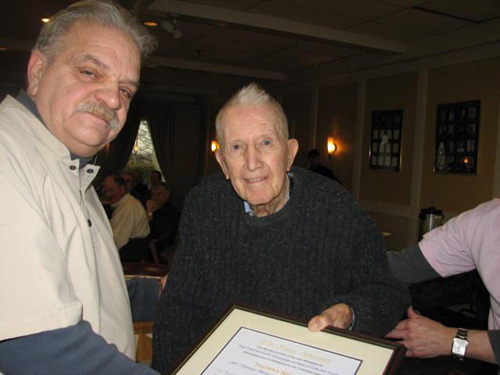 Outgoing President Peter Tibando presents Venerables Appreciation Award to 101-year-old Tom Millar, the club's first president.